No photographer would be able to produce fantastic quality images without proper lighting. Unless you have a MEGA camera with an ability to create high-quality images in low light conditions. Whether you capture images inside a studio or in the outdoors, one of the most important and sadly also an underrated tool that you need to have is a reflector. If you are learning to be a photographer, choosing and using a reflector may be a daunting task. That is why in this short article, we will learn how to use reflectors in photography as effectively as possible and talk about the vital qualities of reflectors. A reflector is essential as it can help a photographer capture photo even under bad and average lighting conditions. Generally, when it is placed below, it will fill in the shadows, and when used from above, it will help in blocking the distracting sunlight or studio light. It can also allow the light to bounce to create some seriously dark and deeper shadows. This underrated photography tool is quite affordable. Most of it comes as a five-in-one bundle. Reflectors come in a range of sizes. If you mainly shoot portraits or are on a lookout for something more portable, then choosing a small sized reflector makes perfect sense. A collapsible 40-inch reflector is ideal in such cases. However, larger sized reflectors tend to diffuse light over a broader space; thus, making the light appear even softer. The downside to that is you will not be able to travel around with it comfortably, especially if you go on hikes and treks. Nevertheless, if you work in a studio, always opt for a largely sized reflector. While round is the most common shape of reflectors, there are other shapes available too, and they play an important role. Reflectors are used to catch the light and are reflected in a person’s eyes. So, the shape of the reflector will ultimately determine what shape of the sparkle will appear in the eyes. Choosing the right color of the reflector will depend on the type of image you want to produce, as well as the type of photography you would practice or do. Silver colored reflectors will increase the highlights and in turn yield an image with higher contrast. This is particularly great for videos, black and white photography, and product shoots. Gold is great as it produces a warm golden glow that looks very natural and is perfect for either indoor portraits or sunsets. Black is typically used as a flag in order to block any light. It is also used in situations when the photographer wants to reduce the amount of light. White is generally used if the aim is to produce an even and neutral-colored bounce light that will work perfectly as a source of fill light. Translucent reflectors are mainly used to diffuse light in order to produce a broad source of light with a soft effect. 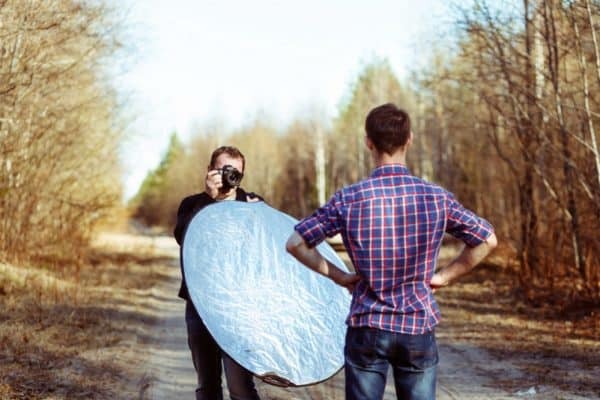 You can either use a reflector by placing it on a stand or asking another person to hold it. You can also ask the subject to hold the reflector, on his or her lap. Keep in mind that when you are shooting images in natural light, your subject should not be looking directly into the reflector as it bounces the UV light. Using a reflector is fairly simple. Start off by holding it at particular angles and determine which angle reflects the light the way you would like. It goes without saying that when placed exactly opposite the light source, you will get the brightest possible light. On the other hand, if you aim to fix odd shadows, the reflector should be placed right in front of the subject, especially if he or she is sitting or standing in the line of light. Although amateur photographers tend to use reflectors mostly in upright angles, do not limit yourself since you can also place it at lower angles. In this way, when you are taking a portrait image, the appearance of under-eye shadows can be prevented. What you just need to do is place the reflector flat on the ground right in front of the subject. Also, keep in mind that the distance of the reflector from the subject can affect the quality of the image. For achieving a soft light, choose a large reflector and place it close to the subject. We have all seen vivid images that have dark shadows. A perfect example of this technique is the famous portrait of Steve Jobs with his hand on his chin. This is actually easily achievable with the help of reflectors. Simply use the black colored reflector and place it on the side of the subject. The black reflector will very clearly create this dark and deep shadow on one side of the subject making it look quite dramatic. This technique is ideal for headshots and adds that element of drama to the images. It is also a great way to give the subject a photographic facelift and get rid of all those extra pounds by using the shadows to cover them up. This can also be the perfect choice when you are capturing body shots since the shadows will make the contours of the body appear more defined. 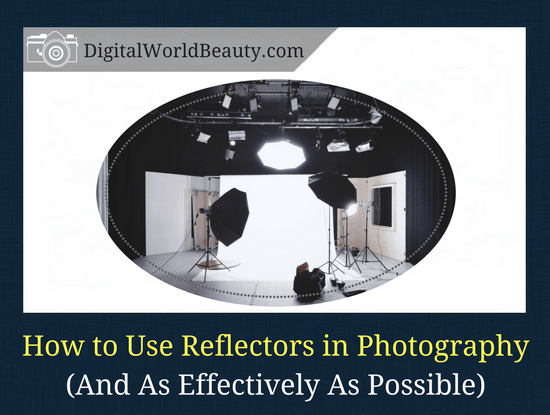 Reflectors might not be high-end looking photography toolkits that you would want to carry around. But they do have the ability to produce highly dramatic and improved images. Mentioned above are the photography basics on how to use reflectors as a beginner. While it does take a while getting the hang of it, we are sure that after a certain point you will not get enough of this tool. Also, once you master it, you might no longer need to always carry a reflector with you since the outside world comes with its own reflectors like a glass building that directly gets hit by the sunlight. 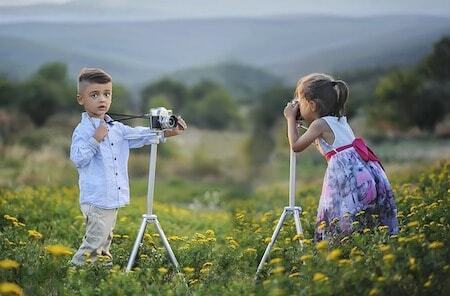 Practice is exceptionally important in becoming a better photographer.